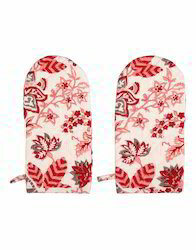 "Protect your fingers with these cotton oven gloves while you cook, bake or grill. The pack has 2 gloves that help to manage the hot pot and other hot utensils with great ease. The quilted gloves have sufficient cotton fill that protects our hand from excessive heat. Comfortable to wear, the thick fabric made double oven gloves are durable and good for daily use. 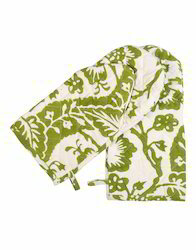 The kitchen mitts have attractive hand block prints and come with a loop to hang. Best oven glove that is to be dry cleaned only for longevity." We are offering our customers an excellent quality range of kitchen mittens. 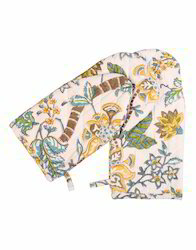 Wholesale indian cotton hand block printed cotton oven mitt. We are engaged in manufacturing and exporting wide range of all type of oven glove. Our products include such as fabric oven glove. We are offering our customers an excellent quality range of Hand glove. 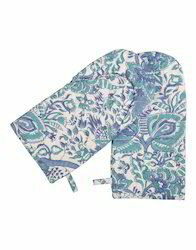 Wholesale indian cotton hand block printed Oven Mitt. We are engaged in manufacturing and exporting wide range of all type of kitchen textile glove. Our products include such as fabric oven glove. We are offering our customers an excellent quality range of Kitchen Textile Oven Glove. Wholesale Indian Cotton Hand Block Printed Glove. we are engaged in manufacturing and exporting wide range of All Type of Kitchen Cotton Glove. Our products include such as Fabric Oven Glove. We are offering our customers an excellent quality range of kitchen mitts. Wholesale indian cotton hand block printed Oven gloves. We are engaged in manufacturing and exporting wide range of all type of kitchen textile glove. Our products include such as fabric oven glove.